For most of us exercising on an empty stomach is not a good idea. Depriving your body of the fuel it needs to function properly will impact the quality of your exercise, the energy you can put into and it can also make you irritable and prone to over indulge after a training session. So a healthy plate of food is essential in order to make our bodies feel good before and after workouts. A lot has been said about the need for an appropriate amount of protein that is required for your muscles to sustain the effort you put into your workout and to regenerate after the breakdown that occurs while exercising. Pre workout carbs usually get the rough end of the macros discussion but the truth is that they are the primary and most important source of energy for the body, thus making them an essential part of any diet plan especially when we are active. Not all pre workout carbs are created equal, so make sure to stay away from refined grains such as white breads and pasta, cookies, cakes and cereal, as well as highly-processed sugary drinks, candy and desserts. Not only do these foods give you a spike in blood sugar that will wear out fast and leave you craving for move, but they are also correlated with a higher chance of heart disease, type 2 diabetes, obesity, metabolic syndrome and even some cancers. 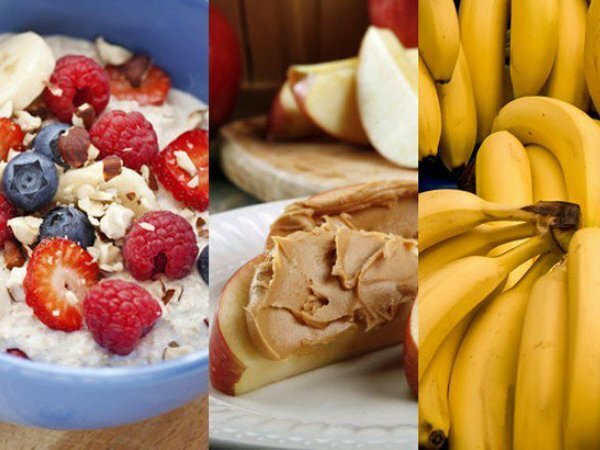 Luckily, these foods are easy to replace. Focusing on whole grains and high-carb veggies and fruits will give you the boost you need to dive into your preferred exercise routine, and also supply a healthy amount of vitamins and minerals, making supplements obsolete. Now let’s see what foods are best before working out. Whole grain pasta is usually shunned during diets, but they are loaded with complex pre workout carbs that will store energy in your muscles for a longer period of time and will help with endurance. Brown rice is another great source of carbs and has the added value of introducing a hearty amount of fibers and minerals into your diet, decreasing the risk of colon cancer. Whole grain pancakes are energy and fiber packed. Go easy on the syrup and top them with your favorite choice of fresh fruit. Whole grain cereal is perfect for those who prefer eating cereal in the morning. Another food that is high in fiber, cereal offers the opportunity to get a good amount of calcium in since they taste best with milk. Whole grain crackers are perfect if you are in a hurry and need a quick pre workout carbs fix on your way to the gym or your favorite running track. Whole grain bread releases those pre workout carbs pretty quickly which makes it a good choice for a morning meal before the gym. Fruit smoothies are a versatile option since you can vary your choice of fruit and keep things interesting. Whole grain energy bars are easy to make at home so you can customize them with your favorite ingredients. Now that you know what pre workout carbs you should choose, it is important to pinpoint the best time to add them to your daily meal plan. Foods like brown rice, whole grain pasta and pancakes are best to eat three to four hours before your workout, while crackers, breads and cereal work better if eaten 30 min before. Nutrition is an important part of a healthy lifestyle and you cannot achieve your fitness goals unless you pay some attention to it. Not everything is cut in black and white though, so experiment, see what you like and listen to the way your body responds. Peanut butter on apple slices! Wow wee! !